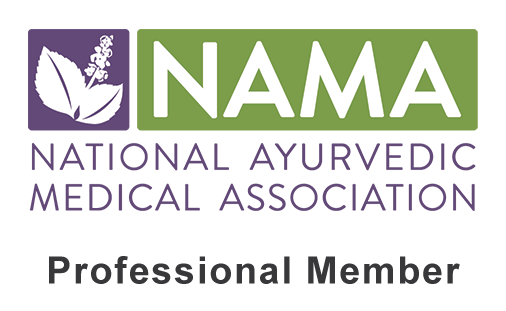 When it comes to treating mental and emotional imbalances, certain Ayurvedic herbs are becoming a bit more mainstream here in the West (i.e. Ashwagandha, Brahmi, etc). However there are many hidden gems that can be utilized that work equally as well, if not better. 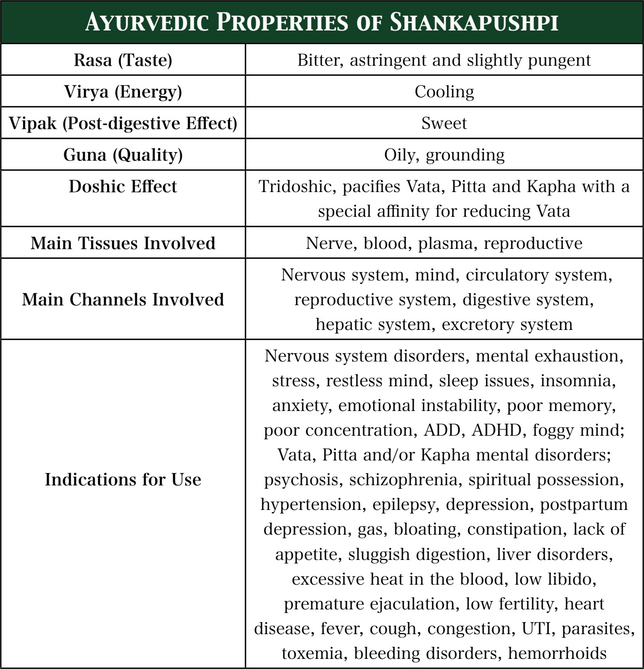 Shankapushpi is by far at the top of this list and therefore is one of my personal favorite and frequently used herbs when treating almost any disorder in the mind or nervous system. Shankapushpi is a well known “medhya rasayana” herb meaning that it promotes mental clarity, a strong intellect and rejuvenation of the mind and nervous system as a whole. It is considered a sacred and sattvic (balanced) plant that can be used by all body types (Vata, Pitta, Kapha) and all mental disorders. Shankapushpi improves the circulation to the brain resulting in a heighten sense of clarity, improved memory and greater focus. Although this herb is highly effective for awakening the mind and intellect, it is equally as grounding and is widely used in treating anxiety, a restless mind, excessive worry and sleep disorders of all kinds. Being a very balanced plant, Shankapushpi is safe and gentle for treating individuals of all ages, from young children to those of old age. In fact it is often an herb of choice when treating ADD, ADHD and other mental/emotional disorders in children, as well as preventing or treating memory loss in the elderly. Although caution and awareness should be used with any herbal regimen, there are no known side effects when using Shankapushpi. 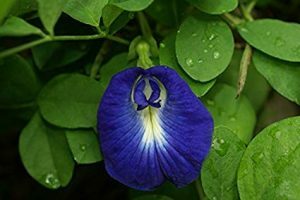 Despite the long list of health benefits Shankapushpi bestows upon the mind, this sacred plant also possesses multiple other healing properties as well. The most notable include promoting restful sleep, removing gas, bloating and constipation; increasing the appetite, strengthening the digestion, enhancing the libido, improving fertility (in both men and women), detoxifying the liver, improving the health of the hair (external use), treating skin disorders (internal and external use), alleviating cough and fever, reducing the blood pressure and promoting heart health. Take 1/4 tsp each of Shankapushpi, Jatamansi and Brahmi blended together. Mix these herbs in 1 tsp of ghee* to form a paste and take this in warm water three times a day after meals. *For more potency replace the plain ghee with 1 tsp of Majja Ghrita. Blend the herbs Shankapushpi, Jatamansi and Brahmi (in equal parts) together and take 1/4 tsp, 2 times daily; once upon awakening and again between 2-4pm. This can be blended in honey to help the child take it down easier and should be followed by a few sips of warm water. Alternatively one can take 1/4 tsp of Majja Ghrita blended with honey, 2 times daily; once upon awakening and again between 2-4pm. Blend the herbs Shankapushpi, Jatamansi and Brahmi (in equal parts) together and take 1/2 tsp, 2 times daily; once upon awakening and again between 2-4pm. This can be blended in honey to help the child take it down easier and should be followed by a few sips of warm water. Alternatively one can take 1/2 tsp of Majja Ghrita blended with honey, 2 times daily; once upon awakening and again between 2-4pm. Also try our Saraswati Churna! Boil 1 cup of milk and 1/2 cup of water in a small pan and then turn the heat to a simmer. 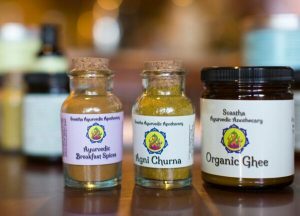 Add in 1/2 tsp* of Shankapushpi, 1/2 tsp* of Ashwagandha and 1 tsp of ghee. Blend well and cover leaving only a slight crack to allow the water to evaporate. Simmer here until all of the water is gone and only 1 cup of liquid remains. Drink this 15-30 minutes before the desired bedtime each night. *On extra restless nights, 1 tsp of each herb can be taken. For additional treatment, one should massage the scalp, forehead and feet with an oil infused with Shankapushpi such as Vata Massage Oil. Also try our Sleep Easy Tincture! Boil 4 cups of water in a small pan and then reduce the heat to a simmer. Mix in 2 tsp of Shankapushpi, 1 tsp of Ashwagandha and 1 tsp of Tulsi and continue to simmer until only 2 cups of the liquid remain. Strain the remaining sediment out using a fine mesh strainer or cheese cloth (optional). Once the tea has cooled a bit, add in 1-2 tsp of honey. Stir well and take one cup of this tea in the morning and one cup again before bed. For increased benefits, one can simultaneously apply Prana Nasya twice daily, once upon awakening and again before bed. Mix 1/2 tsp of Shankapushpi, 1/2 tsp of Brahmi and 1 tsp of honey in 1/2-1 cup of warm milk. Take this twice daily, once upon awakening and again mid-day (2-3pm). Also try our Mind Tonic Tincture! Mix 1/2 tsp of Shankapushpi, 1/2 tsp of Ashwagandha and 1/2 tsp of ghee in 1/2 cup of warm milk. Take 2-3 times daily after meals or as needed with acute symptoms. For increased benefits, one can simultaneously apply Prana Nasya twice daily, once upon awakening and again before bed. Mix 1/2 tsp of Shankapushpi, 1/2 tsp of Punarnava, 1/4 tsp of Vacha and a pinch of Ginger in 1/2 cup of warm honey water. Take this 2 times daily, once upon awakening and again around 6pm. For increased benefits, one can simultaneously apply Prana Nasya twice daily, once upon awakening and again around 6-8pm (wait at least 30 minutes after dinner). Take 1/2 tsp each of Shankapushpi, Brahmi and Jatamansi in 1/2 cup of warm water three times daily, after meals. Take this for at least 30 days consistently, or as long as needed. For severe emotional issues, one should simultaneously add 1/2 tsp of Majja Ghrita to the mixture above and apply Prana Nasya twice daily, once upon awakening and again before bed. For prevention of episodes, take 1 tsp of Shankapushpi with 1/4 tsp of Vacha, three times daily in 1/2 cup of warm milk. Take this upon awakening and again between meals. For extra potency add in 1/2 tsp of Majja Ghrita to each dosage. Mix 1/2 tsp of Shankapushpi, 1/4 tsp of Kutki, 1/4 tsp Turmeric and 1 Tbsp of Aloe in 1/2 cup of warm water. Take this three times daily before meals. **This recipe can be used in most skin disorders as well. Mix 1/2 tsp of Shankapushpi, 1/4 tsp Haritaki and 1 tsp of ghee in 1/2-1 cup of warm milk before bed each night to promote a healthy bowel movement in the morning. For more sever constipation issues, double the amount of Shankapushpi and Haritaki as needed. Take 1/2 tsp of Shankapushpi and 1/2 tsp of Arjuna powder in 1/2 cup of warm water, three times daily before meals. For extreme cases, 1/4 tsp of Kalmegha OR Karella (bitter melon) can also be added to each dosage. Wonderful, informative blog. Thank you so much for sharing! What combination of this would you recommend for someone who is a stroke victim? Someone who has autism? Please and thank you. Thank you for your questions! If you wish to take Shankapushpi to treat autism, it may be best to take the formula known as Saraswati Churna and/or the medicated ghee known as Majja Ghrita, both of which are very beneficial for this condition. If these are not available, I would recommend to take Shankapushpi with Brahmi and Jatamansi powder. You can blend the three in equal parts and take it at the 1/2 tsp, three times daily in warm water. For a stroke victim, I would blend the Shankapushpi with Ashwagandha and Bala and take it at the 1/2 tsp, three times daily in warm water. For severe conditions, increase the dosage to 1 tsp. The Majja Ghrita can be added to this blend at 1/2 tsp per dosage for more potency. When adding in the medicated ghee, simply allow it to melt into the warm water and then stir in the powdered herbs. I hope this helps! Please let me know if you have any further questions!